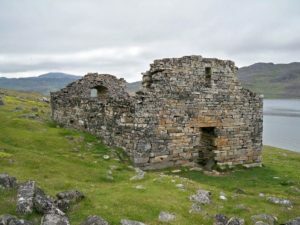 The largest and best preserved pre-Columbian European building in Americas is Hvalsey Fjord Church in southern Greenland. This impressive building was constructed around 1300. As Erik the Red found Greenland (most likely he was not discoverer but definitely – the first settler) and decided to stay there, his shipmate and relative (cousin or uncle) Þorkell (Thorkell) Farserkur around 985 claimed one of the best land plots at the northern bank of Hvalsey Fjord. As time went by, his farmstead turned into one of the most important settlements in Greenland. At its heyday Hvalsey had an impressive church, two stone halls and 14 closely built houses near the church. It is not known when the first church was built in Hvalsey. 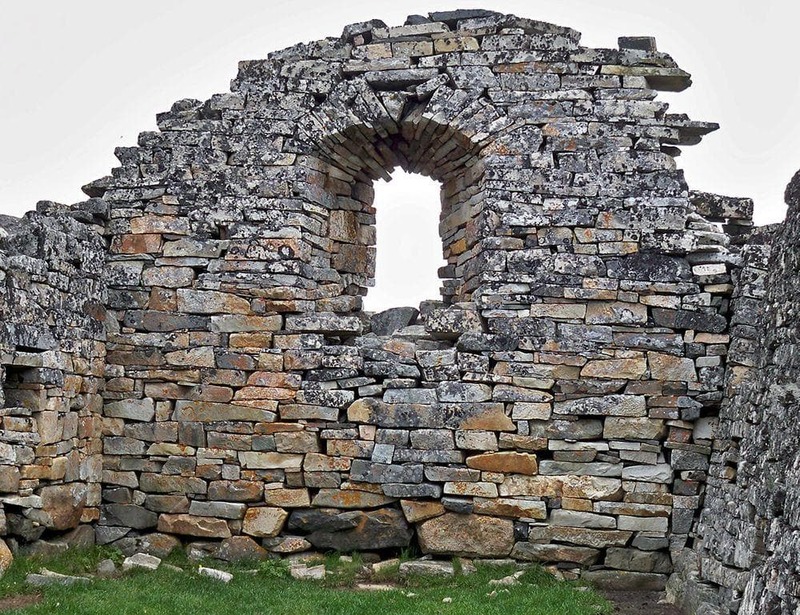 Christianity came early to Greenland – around 1000 AD. Some centuries later in this part of Greenland (so called Eastern Settlement) were built some 10 – 14 churches and, most likely, one was also in Hvalsey. Around 1300 the owners of this farmstead decided to build the best church in Greenland. It seems, that one or several skilled masons were brought here and there was built an impressive, high quality structure. Some structural details show that works were managed by Scottish masons and not Icelandic ones, f.e. the window openings inside are wider than outside and this is more characteristic for early churches in Britain (Orkney Islands). This church was built from local granite stone. Stonemasons did great work: the best material was chosen and it was worked with great precision. 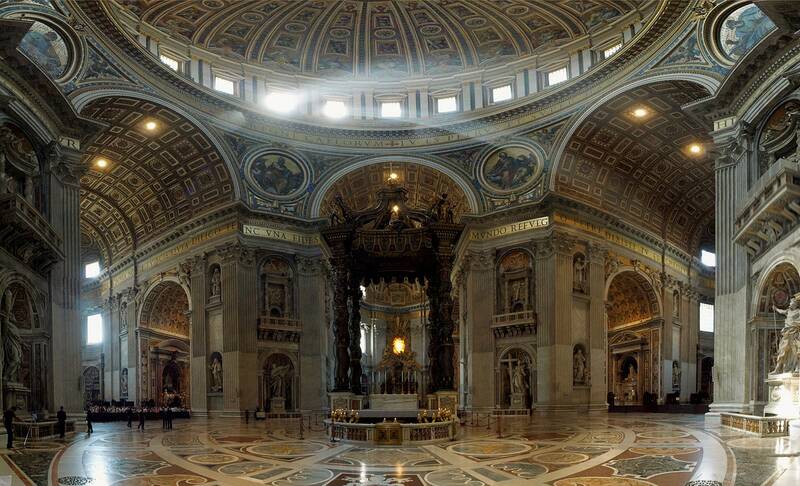 Largest pieces of granite in the walls of church are more than 5 tons heavy. Thanks to high quality work remnants of this church have been preserved much better than any other Norse structures in Greenland. Nevertheless one serious mistake was made: builders built the church over an graveyard (One more hint that there was an older church before this one!) and did not remove graves. Later this caused the sinking of foundation and led to collapse of walls. Hvalsey Fjord Church is 16 by 8 m large on outside. Its walls are up to 1.5 m thick. Inside was enough place for 30 – 35 churchgoers. Most likely this church was bright white – for mortar and plastering was used lime, which was made from ground shells. Roof could be made from timber and turf. Currently the gables rise 5 – 6 m high but originally these could be 8 m high. One window had an arch, but other windows and doors were built by using lintels. Around the church is smaller dike which marks the borders of medieval graveyard. Global climate changed in the 14th century: started the Little Ice Age. The life in Greenland became harder and harder and finally it was unbearable for Europeans. Archaeological data shows that initially the diet of Norse consisted of 80% of agricultural products but in the 14th century Norse for most part lived from fish which constituted 50 – 80% of their diet. One by one the Norse settlements of Greenland were abandoned. It is well possible that Hvalsey was the last one. Last written record about Norse in Greenland is from 16 (14?) September 1408: then in Hvalsoe Fjord Church were married Þorsteinn Ólafsson and Sigríður Björnsdóttir. Two years later this married couple returned to Norway and then went to Iceland and lived in Akrar, brides farm. For more than three centuries Europeans did not know how Norse are doing in Greenland. Only in 1721 Danish missionary Hans Egede came to look for them and discovered that none remain. He visited Hvalsey in 1723 and, according to his reports, the church was in ruiins, similar to its state today. Nowadays the abandoned Hvalsey serves as a grazing area for sheep. Ruins of the church were conserved in 1999 to prevent the sinking of founfdations. Georg Nyegaard. Restoration of the Hvalsey Fjord Church. Journal of the North Atlantic 2(sp2):7-18. 2009. 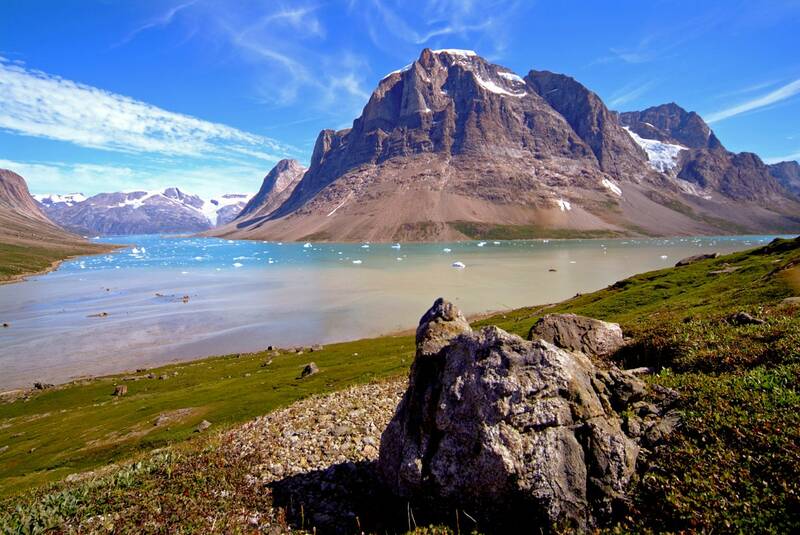 Although Greenland is the largest island in the world, its wonders and landmarks are surprisingly little known. Most memorable is the breathtaking scenery of this northern land. Greenland offers harsh, rugged sights, but in the late spring the meadows are covered with millions of flowers – and in the south could be found even a small forest! Throughout the history Christian churches have been the epitome of architecture and arts achievements in Western culture. Greenland, one of the last truly wild places, contains a treasure trove of information on Earth’s early history embedded in its pristine landscape. Over numerous seasons, William E. Glassley and two fellow geologists traveled there to collect samples and observe rock formations for evidence to prove a contested theory that plate tectonics, the movement of Earth’s crust over its molten core, is a much more ancient process than some believed. For the last decade, Gretel Ehrlich has been obsessed by an island, a terrain, a culture, and the treacherous beauty of a world that is defined by ice. In This Cold Heaven she combines the story of her travels with history and cultural anthropology to reveal a Greenland that few of us could otherwise imagine.